If DST were to make DBZ minimates what would you like to see? Would you want DST to make them like they do Marvel waves, where they're random characters and army builders? or would prefer the WD approach of starting at the beginning and checking off characters as they're released? To me it doesn't matter, this is my most wanted property, and I would be excited if there was a one off box set, let alone a line! Here are two waves with both styles. Piccolo with removable cape and alternate head without turban with a special beam cannon/ Krillin with a destructo disk. Lame! Where are the guys who were talking about this on FB? 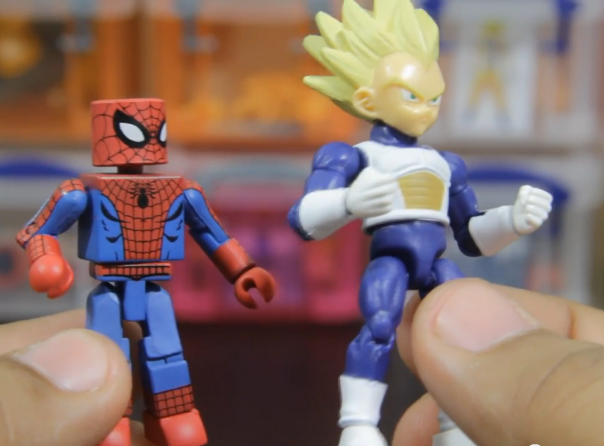 As long as DST makes em DBZ minimates...any character is fine by me. Zak, I will talk all day with you about this. This is also my most wanted property. Whether it's a wave or not alters my choices. If waves could keep going on, my thoughts would be geared more toward your choices. With the addition of dragon balls as accessories. Transparent dragon balls? That would be fantastic. The four star ball with Goku, of course. But...if waves aren't where it would go, or if it's as limited as some licenses(1-4 waves), some things change in my opinion. Goku-Something similar to the Street Fighter blasts, I'm sure. But maybe to squeeze everything out of the possible few mates we could get, I would love to see several hairpieces with him. That way we could get more super saiyan forms. 1-3, at least. Leaving room for the early Goku and a later super saiyan 4. Vegeta-Similar to Goku, but he has more options in some cases. Saiyan armor, super saiyan(maybe with majin head), super saiyan 4, etc. These are just examples. With boxsets, maybe each boxset could be dedicated to a certain saga. It would make it difficult to get more characters, but I would seriously be absolutely thrilled to get one Goku mate. Nappa or Raditz-Nappa could be made with powerhouse chest, of course. Energy ball. Raditz would just look awesome. Both with scouters. Piccolo-Special beam cannon. I would prefer Raditz above so a possible special beam hole could be integrated somehow. Goku-Spirit bomb! Bare feet. It would be a nice addition to have a sculpted Gohan or sculpted Bubbles(king kai's monkey). Maybe the giant cricket. I don't know. If this is treated as the one and only early Goku, I vote for the power pole or sculpted nimbus. I feel I'm getting ahead of myself with this. Final form Frieza. Death ball, removable tail to show when it was cut off. Goku..super saiyan, base form. Kamehameha, alternate head piece with alternate colored eyes and serious supah saiyan anger, possibly alternate chest piece to show battle damaged like mentioned above. Maybe Krillin with the Frieza 2nd form horn battle damage through him. I always loved his saiyan armor in this saga. Destructo disc. Possibly Captain Ginyu or Zarbon. Blast effect, and we must have a sculpted Ginyu frog. A thought I had for Ginyu was making it a powerhouse chest and placing one of the other Ginyu members under. Or doing the same with Zarbon and placing his monster form over him Hulk style. You could actually do the same with Frieza and put final form under 2nd form or something to be more cohesive with having Krillin in the package. These are just examples of boxsets. I could really see this working well with reusing parts from street fighter(blasts, Ryu's suit). Each boxset could come with a number of dragon balls to "collect them all" and that jazz. Anyway, I would adore this license. I'll never stop voting for it. Good call on Zarbon! It would be cool to have him be like Blob from XMOW with the slip over mask and a chest piece. Good ideas overall, I'm glad you posted Josh! Absolutely! I'm happy to share my thoughts. I can't speak heavily and confidently on everything marvel, but there are a few properties I know inside and out and this is one. But three people posting on here probably isn't a great sign of demand, haha. However, it's been many years since I've seen a Dbz toy in a store. It would feel great to see them again. I love DBZ so much, and I would be enthralled to have minimates of them. I haven't watched the show in a while, need to change that now. I think you guys have some great ideas, Zak and Josh, especially with all the alternate parts and energy blasts. Throwing my hat into the ring, I think the best way for DBZ mates to work would be to do a Star Trek Legacy type formula. Covering main/favorite characters in two packs; were the pack-ins relate to each other, but the wave covers multiple points in the show. Frieza comes in 100% power final form, with original final form underneath and comes with death cannon. Bulma comes with dragon ball scanner and smiling face and angry face. When there is a figure with SS pack ins and for Bulma, I mean a new hair piece but one head with tampos on each side, like jubilee. So all that you have to do is switch the head, since these packs will have a lot in them already. I would also like to see minimate size Dragon Balls packed in the TRU pack at 2 per pack for 3 packs and the last dragon ball and a holder for all them in the 4th pack. In the LCS wave I would love a Shenlong BAF as well. 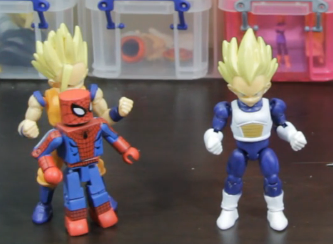 Would anyone be mad if Super Android 13 had the same hair sculpt as Vegeta painted red? I think it would have to be. They look almost the same; but mainly with all the new tooling this line would require, part reuse will be a must for the line's success. Haha I'm teasing! They can do what ever they want and I'd buy it! Seriously, if we could get this with all the new tooling and all the additional pack-in parts, I would easily pay upwards of 10.99-12.99 per two pack. They would be that worth it to me. Oh, and a maybe a floating halo piece that plugs into a little hole in Goku's hair too! SuperChef, you thought of a lot of cool ideas I didn't! I love SS2 Cell Saga Gohan and would love to see how DST would do Cell himself. Also, Future Trunks is a cool thought. I love him and his sword and I think he would be a welcome addition. I really love the idea of the pile of discarded boots and such for Goku giving an example of the weighted clothing. My favorite thing you noted, however very simple, was the idea of having 100% power Frieza over regular final form. Very cool and simple idea. Master Roshi and the Vegito spirit sword are both two things I would LOVE to see created. Fitting the spirit sword over a fist would be great. Your way of thinking, Chef, is the way I could definitely see this going. A "greatest hits" of the sagas may run more and get us more than focusing on one saga as a wave. That and a few cool boxsets. Maybe Turles. and Zak..yeah, haha, I would take a repainted hair piece without much heartache. It's as doable as the Marvel vs Capcom Captain America and Best Of 2 punisher's hairpieces. I'm sure those are used many other places, those are just the two examples I know I have. and both ended up looking dandy. Halo piece would be cool. In a world where the tv series was still running hot and weekly, I could see a halo Goku work as a con exclusive packed with Pikkon. Oh, and I want Nova Shenron. Give me that. I know it isn't DBZ and getting into GT opens a whole 3 more wave possibilities, but give me Nova. Just make me a custom. haha. Do teen Gohan and characters like Krillin, and Kid Boo have the shortened legs and arms? That's neat. I never bothered with GT. I did, but it was quite a different animal. This could be worth the watch. Maybe more of the original spirit. There are a lot of Dragon Ball fans, I think they'd sell better then some MM lines that exist today. With the recent decline in new stuff related to this, I think there was a decent reason. Now, I think it's going to roar back a bit. Maybe it can follow a similar road TMNT does. Probably the closest you'll get to Minimates, I think these fit the license better than 'mates would. I have no idea, those aren't my pictures. Just something I randomly found. Ah, well, thank you a ton. They are pretty well-sized. 66 Action Dragon Ball Kai. The Barnes and Noble I work at carries them. I hope there's a wave 2. 4 characters per wave so maybe non SS Goku, Piccolo, Freeza, and Krillin for W2.